The writer at the World Storytelling Day in March. Grandparents carry a wealth of stories within them; personal stories of family life as well as traditional stories like legends, folktales and fairytales. I grew up seated at my grandfather’s knee listening to him tell me tales of the grand epic “The Ramayana”, animal tales from “The Panchatantra” and also the stories of his emigration from Kerala to Malaya. He made the various family members that we never met come alive by painting vivid pictures of a stern grand-uncle who walked with a wooden cane and a great-grandfather who rode on a white horse. His voice would emulate their accents and he would speak as they did! This catapulted us grandchildren into ‘once upon a time’ and we were mesmerised. Sharing personal stories is a wonderful way to bond with the next generation and to pass on the family heritage. When we were very young, he told us about the war in Malaya. My great-grandmother had 11 children to feed and one day as she stood stirring a pot of jackfruit jam, the Japanese soldiers entered the house, smelled the sweet dish, lifted the entire pot and took it away with them. Once we got older, my grandfather explained to us that sugar was a rationed item during the war and the only reason my great-grandmother escaped the gallows was because she explained the sweetness came from the jackfruit itself. 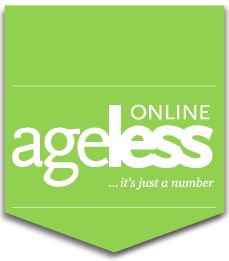 The ideal way to share stories with the younger generation is to keep the duration and content age appropriate. Little ones have very short attention spans, so you can tell them a few short stories throughout the day. Older children have a higher cognition level and yearn for more fully fleshed out plots and stories with characters. It is advisable to start off sharing a short personal story and then lead into a cultural or traditional legend or myth. Grandparents are usually the only keepers of the tales and if they do not pass on these tales, the stories stop with them. A creative and participative way of archiving these stories is to make a ‘story map’ of the story with your grandchild. Simple drawings and paintings that depict the locations, characters and main focal points of the story are permanent visual records. These will definitely help the younger generation remember and recall their grandparent’s story and allow them to also re-tell it in the future. 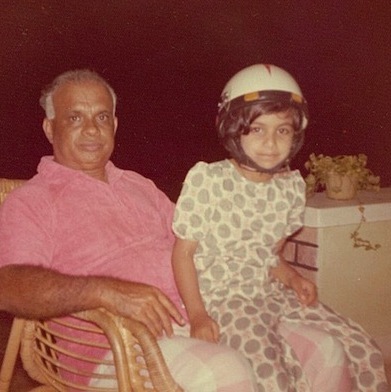 The writer with her maternal grandfather PR Viswanathan. A good storyteller makes the story come alive before his listeners and paints the pictures vividly for them to see in their minds. One of the techniques my grandfather employed was to use expression and gestures. He would puff out his cheeks and pull his lips inwards as he emulated Hanuman, the general of the monkey army! He used his hands a lot to describe ‘tall trees’ and ‘far away kingdoms’. He varied his pace so there were parts of the story that were slow (when Tortoise walked) and parts that were fast (when Hare raced up the hill). These simple skills can be used by anyone who wants to share a story. As with all things, practice makes perfect! My fondest memory of my grandfather is of him storytelling to his grandchildren before he had his afternoon nap. Those afternoons were filled with a sense of security and comfort as his voice resonated in the bedroom. When I left to seek my fortune in a land far away, he continued his stories through the many beautiful handwritten letters he mailed to me. Every time I tell one of his stories, I feel that same sense of comfort and security I experienced as a child. Kamini Ramachandran is a professional storyteller and co-founder of MoonShadow Stories. She conducts workshops on storytelling and how to incorporate it in our lives.